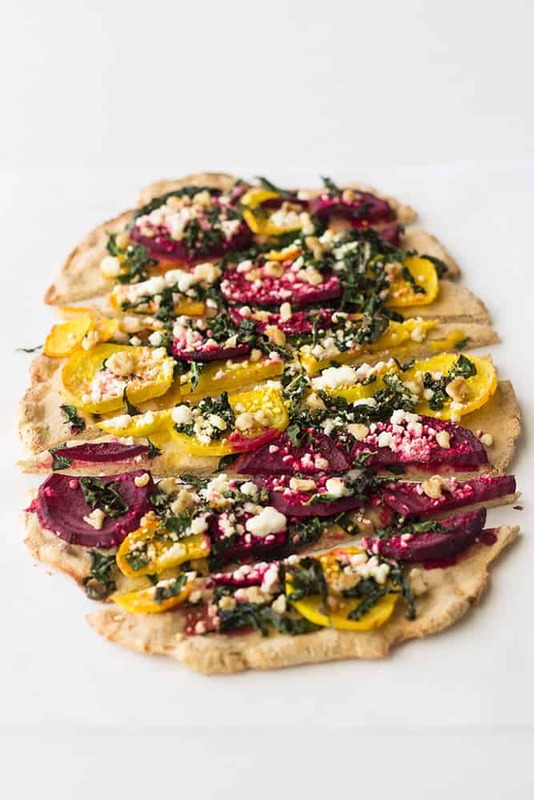 This whole grain kale beet pizza with goat cheese is topped with vibrant vegetables for a wonderful lunch option. Traditionally us bloggers start off the year by posting health food after a barrage of sweets in December, right? I figured I would ease y’all into January a little bit by making a pizza instead of a straight-up salad like I did last year with my broccoli white bean salad. After all, pizza is the common unifier of our time. Or something. We have pizza weekly at my house, and while I love my routine for other things, having the same meal over and over is just not my bag. So while I will make the standard cheese-and-pepperoni pizza (or pepperoni calzones) for the kids, I try different things with the grown-up pizzas. I’ve done all sorts of combinations, but lately I’ve been veering toward sauceless pizzas. Without tomato sauce in the mix, you can do so much more ingredient experimentation, such as in my Maple-Walnut Chicken Sausage Pizza. Lately though, I’ve been working on eating more nutritiously and adding more veggies to my diet at every meal. Yep, pizza night too. 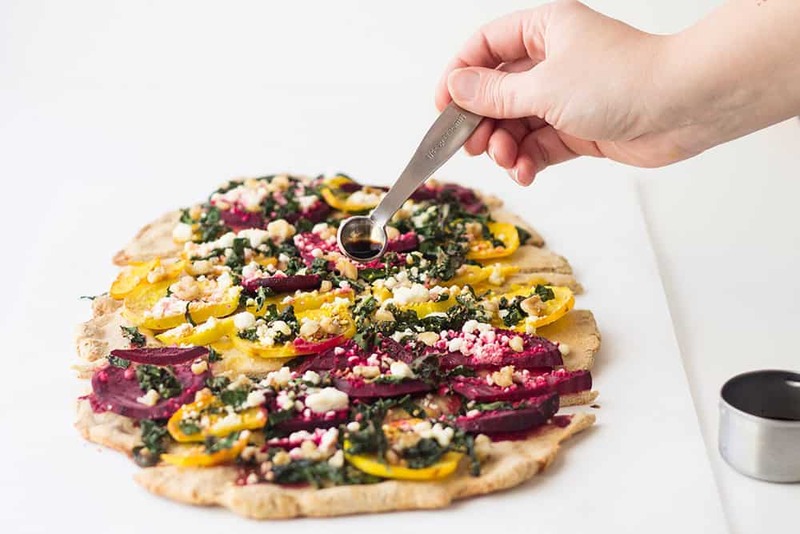 Since pizza is basically a blank slate, this is really easy to do, and I’ve found a great combo in this Kale Beet Pizza with Goat Cheese. Goat cheese (chevre) is probably my favorite cheese of all time so I usually have a big tub of chevre crumbles from Costco in the fridge, and add a bit to almost everything. I’ve found that it’s especially a great pairing for walnuts, so I’ve added those to this as well. The goat cheese crumbles don’t completely melt in the oven, making each bite a unique combination of flavors depending on what’s on your slice. 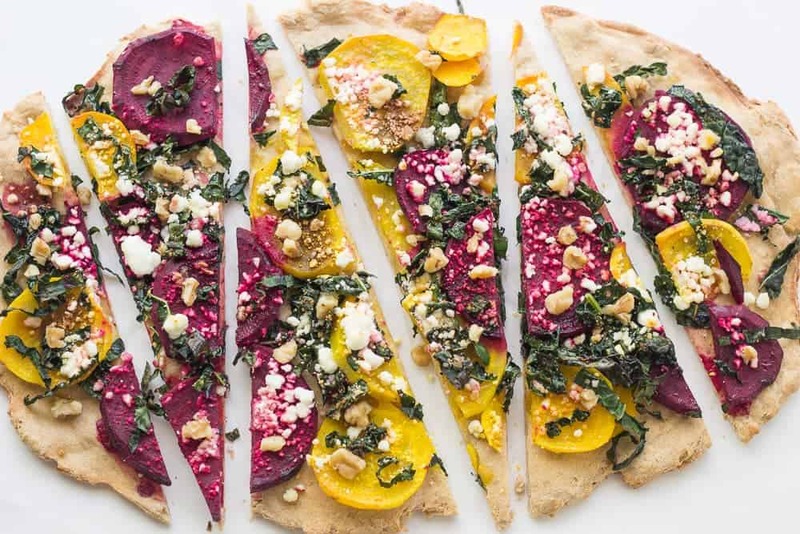 Thinly sliced beets in two colors (or three if you get your hands on gorgeous Chiogga beets, which are candy-cane striped) are the main ingredient in this pizza. The beets sweeten up as they roast, which works beautifully with the goat cheese. Sliced lacinato (dinosaur) kale on top getting just softened enough to remove the tough chew, but preserve the flavor. Be sure to strip the leaves from the tough stem before slicing and placing on top of the pizza. I’m a nut for balsamic and so of course drizzle it on the pizza after baking. My favorite variety is fig balsamic, but any good balsamic will work. If you don’t like balsamic, try it with honey instead. This pizza is great for lunch, and if you use premade dough or flatbread, there’s even less work! 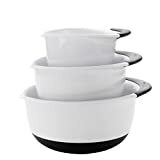 Preheat the oven to 500° F. Coat dough with 1 tablespoon oil and press onto a rimmed baking sheet in a 1-inch thick layer. Bake until edges are golden and dough is puffed, 8-9 minutes. 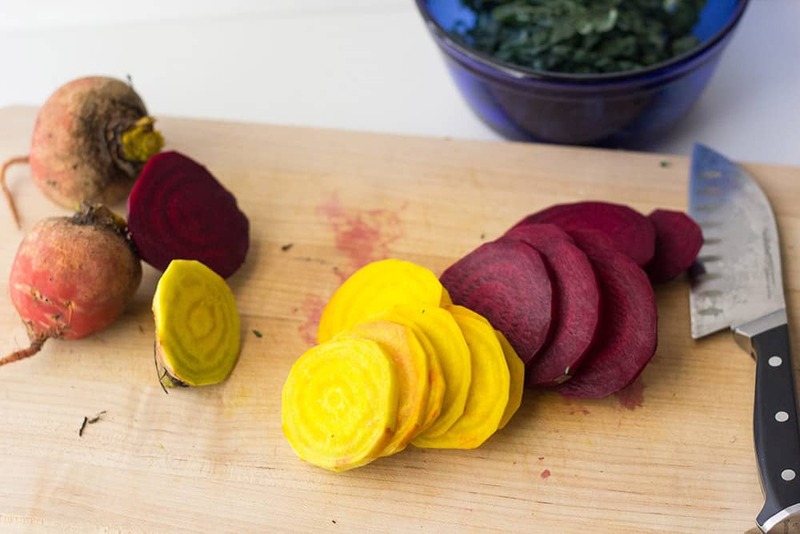 Remove from oven and reduce heat to 425° F.
Combine kale, beets, remaining oil, salt and pepper in a large bowl. 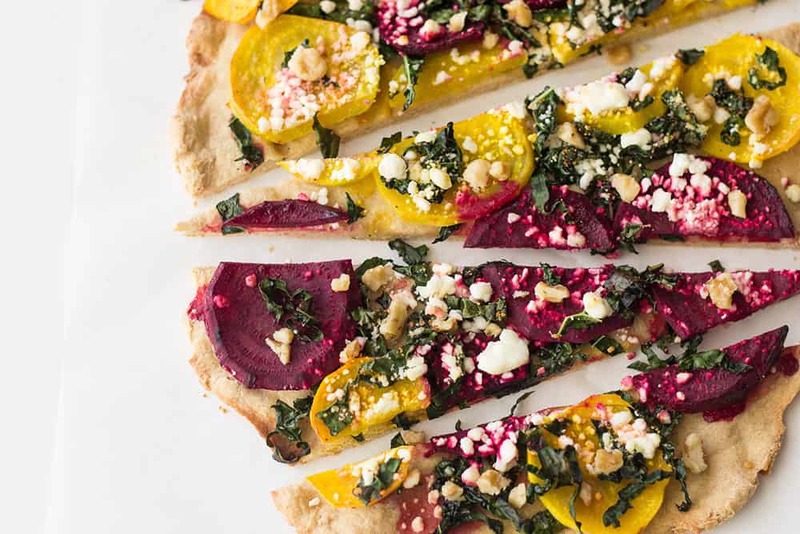 Arrange vegetables evenly over pizza crust, then top with goat cheese. Return to oven and bake until kale is wilted, beets are softened slightly and cheese is melted, 9-10 minutes. Remove from oven, drizzle with vinegar and top with walnuts.